There’s a sense during Jurgen Klopp interviews that he’s often thinking something very loudly but is careful not to say it openly, but when asked about two hot Liverpool prospects, he couldn’t hold back! The manager was speaking following Liverpool’s thumping 5-0 win over Fleetwood Town on Wednesday evening, and lavished praise on Ben Woodburn, who scored, and Ovie Ejaria, who oozed class in midfield for the second game running. “He [Woodburn] is a natural offensive player. It’s nice to see, really nice to see,” Klopp told the official website. “I had a long talk to Alex Inglethorpe and sang the big songs about the boys because they trained great and it’s really good to have them around. 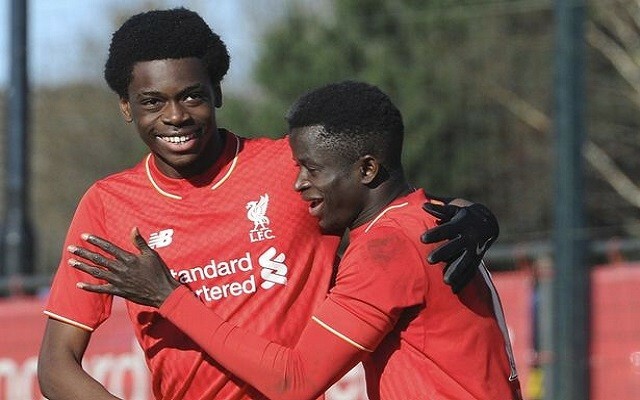 Ejaria signed from Arsenal in 2014, and has developed at such a rate he’s now forced his way into first-team consideration. The Londoner isn’t 19 until November, but against Tranmere and Fleetwood (admittedly not top opposition), he’s elegantly controlled the midfield – with his rangy legs helping him effortlessly cover turf, too. His physicality gives him a good chance of making it in the Premier League, but it’s his composure on the ball and eagerness to drive forward with it that has seen him the topic of many a Liverpool-related discussion since pre-season fixtures began. Interestingly, Ejaria has promised his international future to Nigeria, and going by his current rate of progression, we wouldn’t be surprised if they took him up on that offer soon!